Today I’d like to tell you all about the astonishing success stories of the PDSA. While the accidents that lead the cats and other pets into the care of vets are awful it is very important to raise awareness of the amazing work this charity and all the vets across the globe are doing to safe them. A while ago the charity had asked for submissions of the most amazing survival stories and from this compiled the shortlist of these 6 entries. Please cast your vote here after reading their stories below! Votes close on the 13th of December. A Staffie dog shot through the head with a crossbow and a Pointer run over by a 50mph lorry are among six miracle pets are up for the coveted title of PDSA Pet Survivor 2015. The brave cats and dogs came forward after the vet charity issued a nationwide search for pets who had beaten incredible odds to survive death by a whisker. The winner will be decided by a public vote, which is available here – www.pdsa.org.uk/petsurvivor. 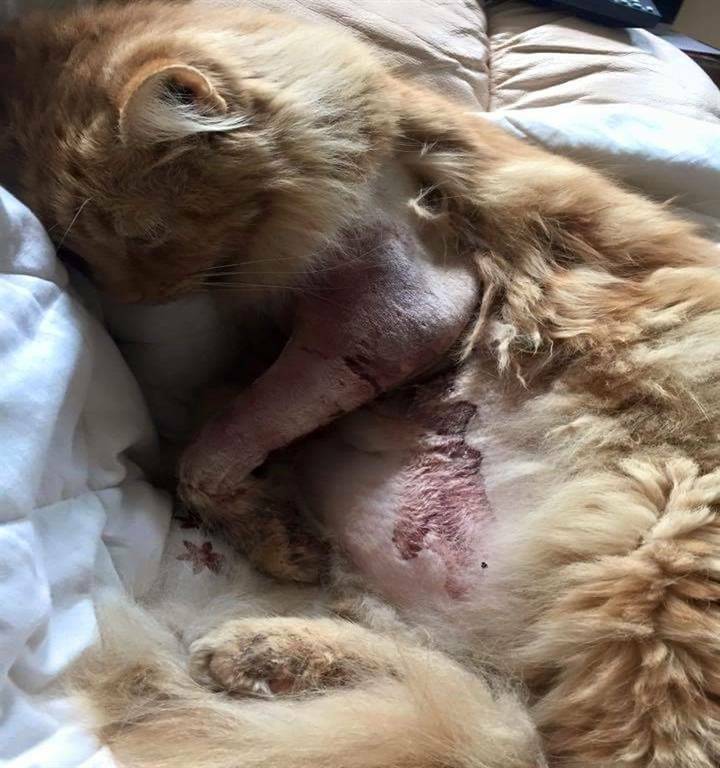 Ginger cat Ozzy fled in terror after being attacked by a dog near his home. His owner Hayley Sharples searched for 36 hours before finding Ozzy – he was barely alive but had somehow managed to crawl home. His owner took him to Huyton PDSA Pet Hospital in Liverpool, his front leg was badly fractured and he had a large gash on his front; he was very lucky to be alive. Vets attempted to save his leg but the bones wouldn’t knit and eventually it had to be amputated. Everyone was amazed at how quickly Ozzy bounced back from his ordeal and he gets around on three legs with no problems. Honey was rushed to Basildon PDSA Pet Hospital after being found covered in blood by her owner, Albert Cook. Vets made an appalling discovery – x-rays showed a huge ball-bearing was lodged in her skull. Poor Honey had been shot in the face. It was touch-and-go whether she would survive, but her survival instinct was strong. It took months of operations to rebuild her shattered eye socket and jaw, during which she had to be fed through a tube. Honey lost her eye but doesn’t let that hold her back, and is now back home with her loving owners. After escaping from her home one evening, Penny found herself on the A1 motorway where a lorry ploughed into her at around 50mph and left her for dead. A couple in the car behind witnessed the incident, and, on discovering Penny, provided her with vital warmth and safety. Skeldale Vets answered the emergency call and on seeing Penny’s shattered shoulder, knew she required urgent surgery. Unable to trace her owner, the vet decided to go ahead with the complex operation, finishing at 2am having decided he would cover the cost if no owner was found. Meanwhile Elaine McGregor, Penny’s owner, had been searching for her all night and was finally reunited later that morning. Months of cage rest followed, but Penny’s leg was saved and she can run like the wind again! Found as a stray with severe burns, thought to have been caused by chemicals, this tiny kitten was taken to Portsmouth PDSA Pet Hospital. Her life hung in the balance: she was clearly in pain but her bright and courageous nature shone through. Natalie Lodge, who was a Veterinary Care Assistant at the hospital, fell in love and offered the kitten a home, naming her Ruby. She needed weeks of treatment at PDSA, then continued to be nursed back to health in her new forever home. She has made a remarkable recovery and her fur is almost completely grown back, although some is now white. After suffering a terrifying dog attack while out on a walk, Suki was rushed to Gateshead PDSA Pet Hospital’s out-of-hours service. Vets warned her distraught owner, Mrs Marjorie Nicholson, to prepare for the worst. A three-hour operation repaired the extensive damage, which included prolapsed intestines, a broken jaw, ruptured spleen and bruised lungs. Vets even found a tooth from the attacker embedded in her abdomen. Remarkably, Suki pulled through, although she still required months of treatments at Sunderland PDSA Pet Hospital to fully recover. But she was a perfect patient and is still as friendly and outgoing to other dogs as she was before her ordeal. 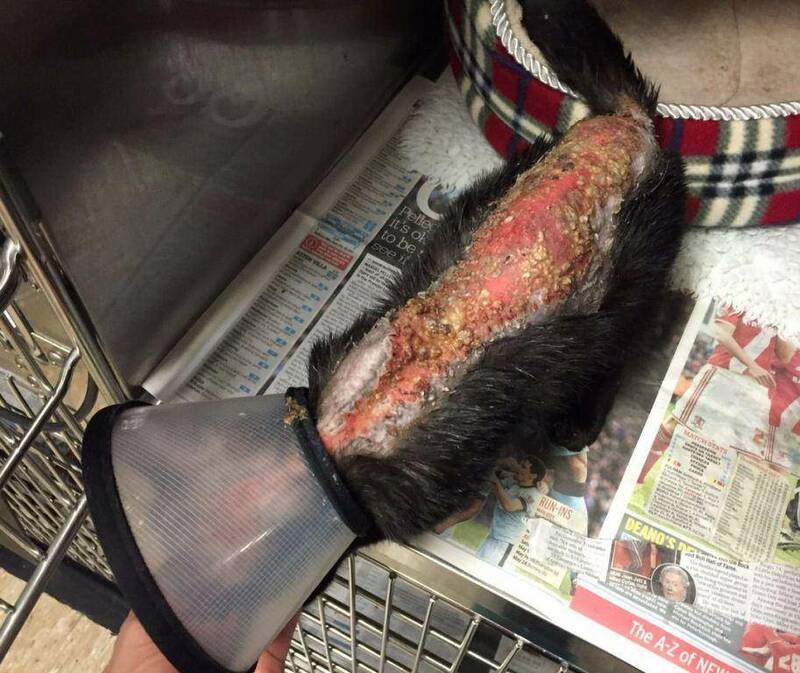 Ziggy was found wandering alone in woodland with a horrific injury – a crossbow was lodged through his head. He was rushed to nearby Vets4Pets in Peterborough where, incredibly, he was still bright and friendly! X-rays revealed the projectile had missed all vital nerves and blood vessels in his head – a one-in-a-million chance. After alerting the RSPCA, the vet conducted the delicate operation to remove the crossbow bolt and, just two weeks later, it was hard to tell anything had happened at all. It is suspected that Ziggy had been deliberately shot, but had turned his head at the last second then run away. Ziggy has since found a loving ‘forever home’ with Dominic O’Hare and Anna Burton-Wood, and couldn’t be happier. Only one vote per person is allowed, the winner will receive the coveted Pet Survivor trophy and a year’s free PDSA pet insurance*. Voting closes at midnight on 13 December 2015. We hope you will take part in this and don’t forget to sign-up to our Newsletter by clicking here. Miracle pets.. it’s lovely when sad stories get turned round into sweet ones. There are some cruel people about. Luckily the good outnumber them. I was in my local PDSA shop yesterday buying diaries. I’ve just voted as has my mum. Animals are so forgiving. We have much to learn from them. All, inspiring pets and stories. Thank you for sharing this. ? You are welcome 🙂 glad you enjoyed their stories. Very much, my friend ? What an inspiring bunch. Always amazing how forgiving and trusting they can be after such horrible things happen! There were all so inspiring. I wish the perpetrators had been caught and punished for what they’ve done. PDSA do amazing work. Thank you for sharing so every one can know what amazing work they do!